I recently had the opportunity to take a class with Lori Sauer here in the bay area. The topic was stub bindings, or bindings which use narrow hinges, flaps, or concertina folds to attach signatures and/or plates (images printed as single sheets). She is a fine bookbinder working in the U.K.,though she is originally American. Her work is highly skilled, her designs are subtle, and she teaches workshops established under the name BINDING re:DEFINED. You can see some of her recent work here. I am always interested in meeting other bookbinders far and near, and the topic of her workshop intrigued me. In the past I’ve been frustrated by stub bindings, since I most often see them as books coming into my studio in need of repair. Puzzled as to how to put these books back together, I study the interlocking stubs, trying to reverse engineer the sewn and glued areas laboriously. I also vividly remember my utter bewilderment about the set book for the Designer Bookbinders’ Water competition. So many plates! Some folded, some flat, and intermingled with folded text signatures; what to do? In the stub binding workshop, we all discovered there are many ways to construct bindings needing stubs. Stubs can be glued or sewn; concertinas can be glued, sewn, or even nested. Stubbed structures can have hard casings for covers, or can be laced into their covers, or can use traditional binding techniques and be purely decorative. What drew me to the workshop was the possibility of looking directly at the problem of stubs and seeing what solutions would present themselves. There is very little written about stub bindings, possibly because they often seem to be made on an ad hoc basis to resolve the truly odd structural situation. The class was very well-organized, with plenty of well-documented methods and techniques to try. It was fun for me to construct all the different models Lori demonstrated, and come up with potential design challenges each could solve. We did not make any finished books in the class, but getting to see the finished models she brought was inspiring. In particular, I was struck by the incorporation of fine binding techniques in her models. I will continue to puzzle over stub bindings, but now in a good way. 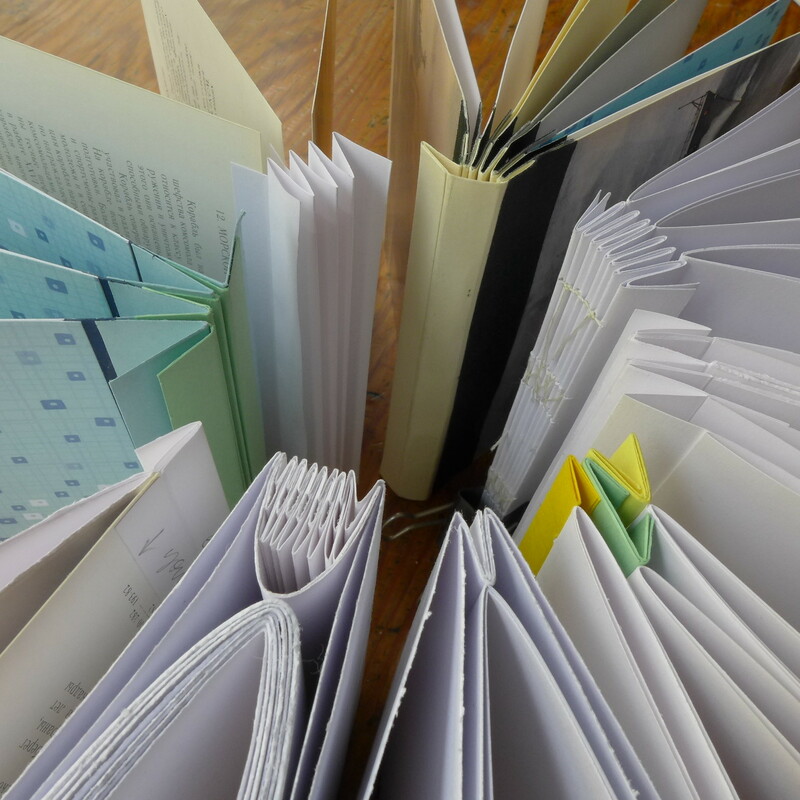 Lori was gracious in agreeing to answer a few questions for my blog about the practice of making stub bindings and about her new appointment as President of Designer Bookbinders UK. I’m so grateful for what I learned from her, and if you are interested in taking one of her workshops, I encourage you to check out the website bookbindingworkshops.com. What got you interested in stub bindings? I was asked to speak at a Society of Bookbinders conference a number of years ago on a structure and stubs was the suggested topic. I knew very little about them but accepted, thinking it would be interesting and a challenge. I discovered there was very little written about them so talked to as many people as possible to get information. I only located one article from the 1950’s by Thomas Harrison. The remainder of my lecture consisted talking about and showing experimental work and books I had made from descriptions or photographs. How do you decide whether and how to use stubs in your binding work? As with all bindings, a text-block is assessed individually before deciding on the appropriate binding. 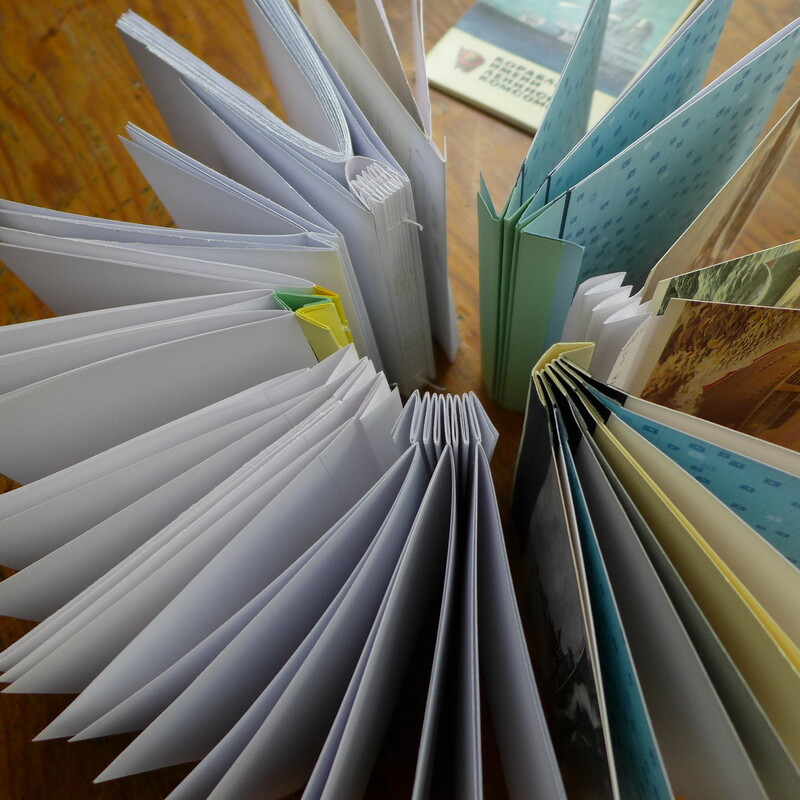 I will decide to use a stub if there is a narrow gutter margin or if the sections are especially thick, printed cross-grain or if I have plates in the book that need a full page spread across the centre fold. I also like using it because the pages will always open flat and this appeals to me enormously. Have you been able to study any historical examples of stubs used in bindings? I’ve only been able to look briefly at historical bindings while visiting some private libraries in the UK. I’ve also been able to have a close look at an old atlas binding lent to me by a friend. Others I’ve been able to take apart and reassemble in work that’s come in to me for repair. My plan is to spend time in the British Library doing some research specifically on stubs. I think there is a lot to be discovered. What are some of your favorite paper stocks to use as stubs? What are the characteristics that make a particular stock work well? I can’t say that I have a favourite paper stock, I tend to choose as I go. It needs to be a paper that folds well and is strong. Conventionally, stubs are discreet so the papers were often lightweight and folded many times, they are meant to be tucked away. For modern usage a stub can be used decoratively as well as structurally so choice of paper gets more complicated. It’s a book-by-book decision for me. Are there other binders doing similar bindings whose work you admire? There is a lot of contemporary fine binding in Spain that is done on stubs and some of the results are stunning. I sadly don’t know any of the names. You are the incoming president of Designer Bookbinders UK (congratulations!). Do you have any goals for your term that you’d like to share? I’m looking forward to my time as President of Designer Bookbinders. We were formed around the premise of being an exhibiting society with the members there as support. I feel things have moved on and we can do more than just put on great exhibitions. DB has a highly respected international position in the bookbinding world and I would like it to be more actively involved with its international counterparts. This might involve an exchange of lecturers, workshops, demonstrations or articles in newsletters. With screens and keyboards at our fingertips it is so easy to give and get information and it’s important that we all share in this craft that we love. This not only benefits us as binders but also benefits the members who support us, domestically and internationally. There are some other things in the pipeline and they all take time. In the meantime, like everyone else, I want to put my head down and make bindings. Very cool! Livermore is beautiful. Hope to see you soon!